As more and more tourists complain about Istanbul’s overcharging taxi drivers, police have increased presence and inspections in the city’s main tourist attraction such as Beyazıt, the Grand Bazaar and Eminönü. “Let’s say I am supposed to pay 20 Turkish Liras for a trip. I hand the driver a 100 Turkish Lira banknote. 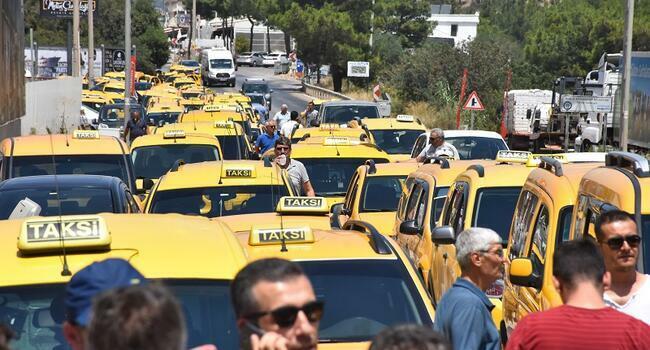 But the driver says ‘no, you gave me 50’ and insists on that,” one tourist told Demirören News Agency. Others tourists said they had the same experience with taxi drivers. “They [taxi drivers] take 100 liras but later deny taking it, claiming I gave them 20 or 50 lira banknotes,” another visitor said. One tourist also said the driver charged 35 liras for a trip, which should normally cost 20 liras. “I paid 40 liras for a journey from the Grand Bazaar to Taksim. Later, I checked on the internet and found I was only supposed to pay 20 liras. The driver first demanded 50 liras. When we refused, he settled for 40,” another tourist said. An Italian tourist exposed another scam scheme. “The driver refused to turn the meter on. We had to pay 65 liras for a very short trip. This journey should have only cost us 25 liras,” they said. Eyüp Aksu, the head of the Istanbul Taxicab Merchants Chamber, vowed to fight against fraudulent cabbies. “We expel taxi drivers who commit such scams and imposed heavy fines on them. I believe we will not receive such complaints once we rid ourselves of such taxi drivers,” Aksu said. Meanwhile, in the face of the growing number of complaints, the police have increased inspections in the city’s major tourist attractions to make sure taxi drivers do not cheat passengers. In those inspections, police talk to tourists traveling in taxis. If they find the taxi drivers have not turned on the meter, police fine the cabbies.